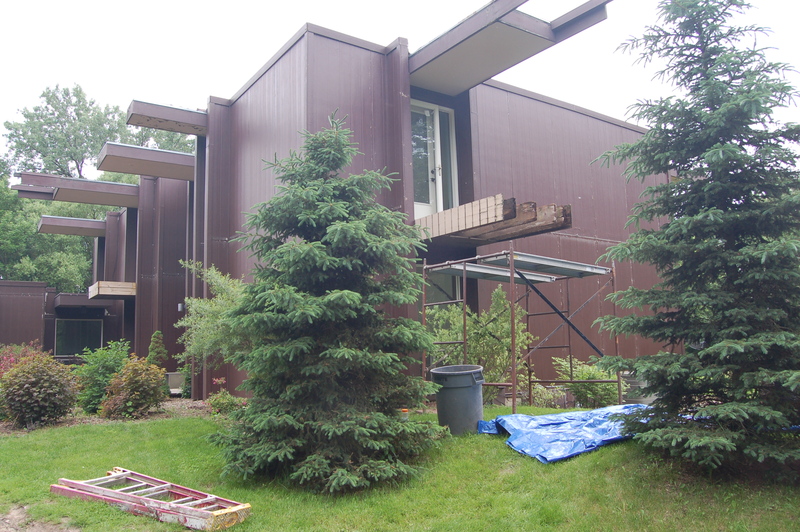 Adventures in remodeling a mid-century gem. Hmmmm. Gotta think about where I left off. Oh, yeah! 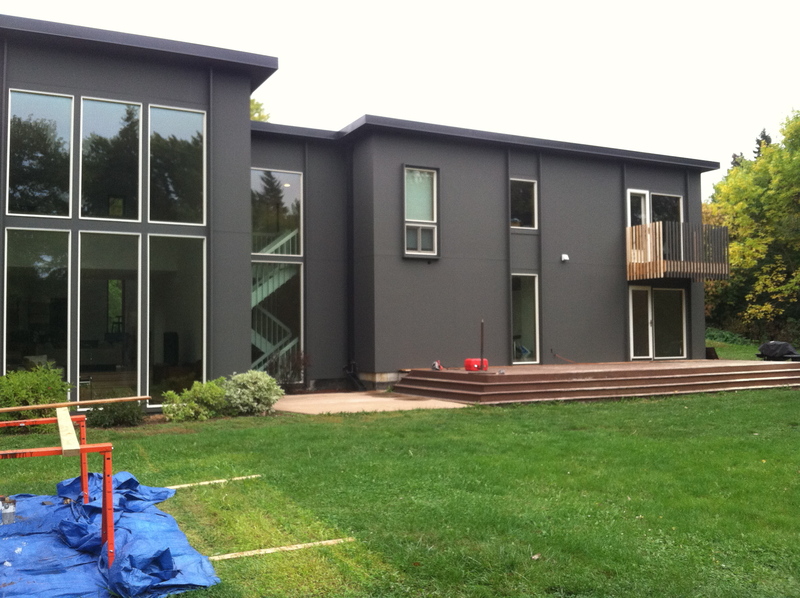 The siding and paint job! The next step was to rebuild the second story balconies. The guys started with the small one on the front of the house… That’s stained cedar for the decking (except for the front board which was originally stained, but I requested another sanding because it was noticeably more rough than the 2 by 4s, so alas, it and the other face-boards were put up unstained. More work for another day!). Above, you see the master deck with the spindles. Some were pre-painted, but we misjudged how many to do, so extras will have to be painted installed. Shoot! Below, there’s a view of the side balcony off the loft. All smiles after completing the job! Balconies all up, just needing a little touch-up paint and stain. Admit it was a bad idea, and ask the guys to redo it. That was hard, but it was the right thing to do, and now all is swell. Lesson learned: Trust the architect when it comes to proportions. 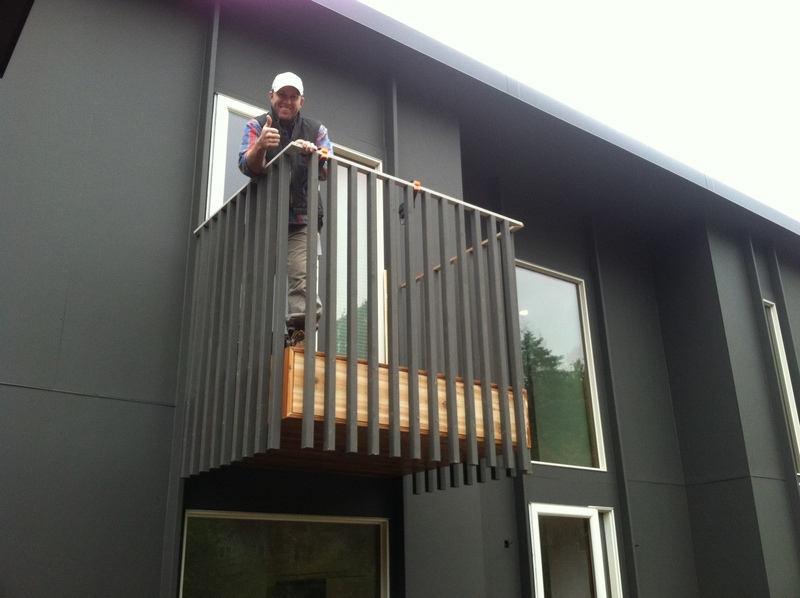 Here’s a pic of the master balcony with the much better railing height (Whew!). 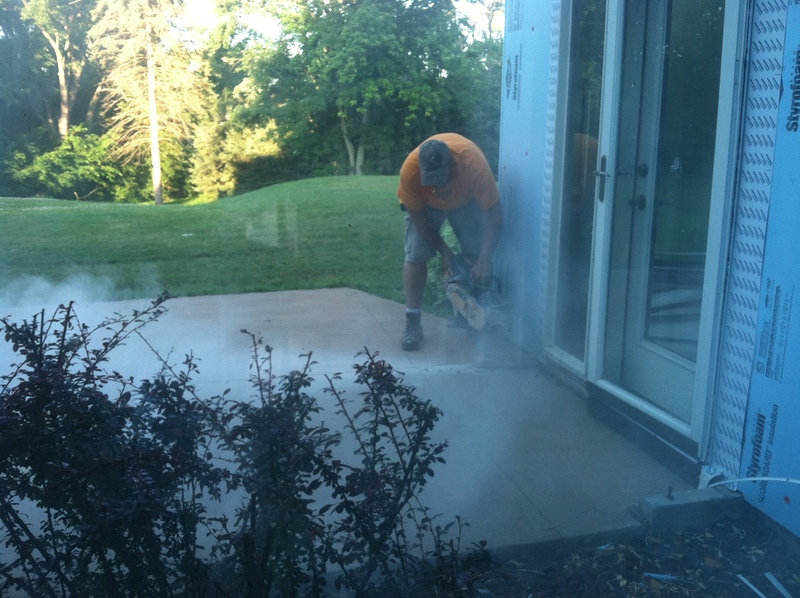 And that would be the husband painting our main level deck. 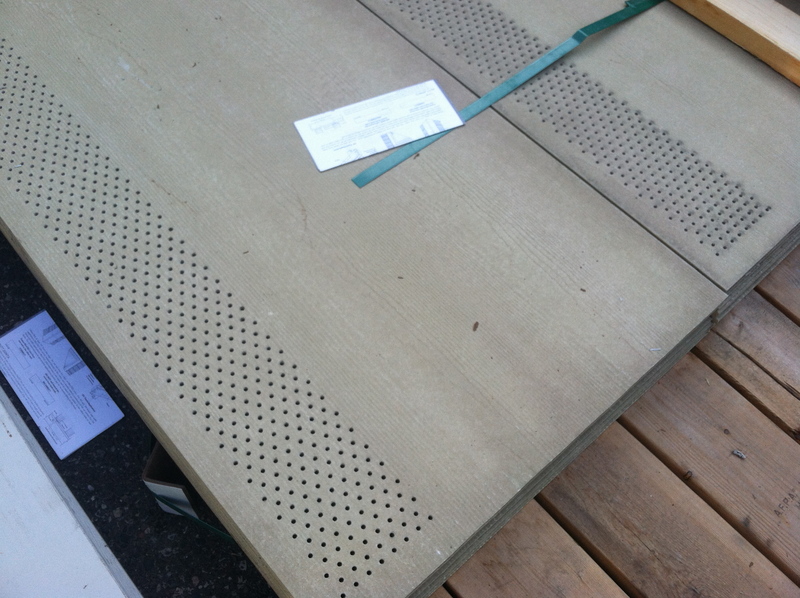 We were told it was too far gone to sand and stain, so we cleaned it up as best we could, and bought deck paint. I thought it might be a good idea to go lighter than the house, but now that we have a first coat down, I can tell we need to go darker. That’s just my luck, but not too tragic of a goof. It always takes me a few tries to get a paint color right! 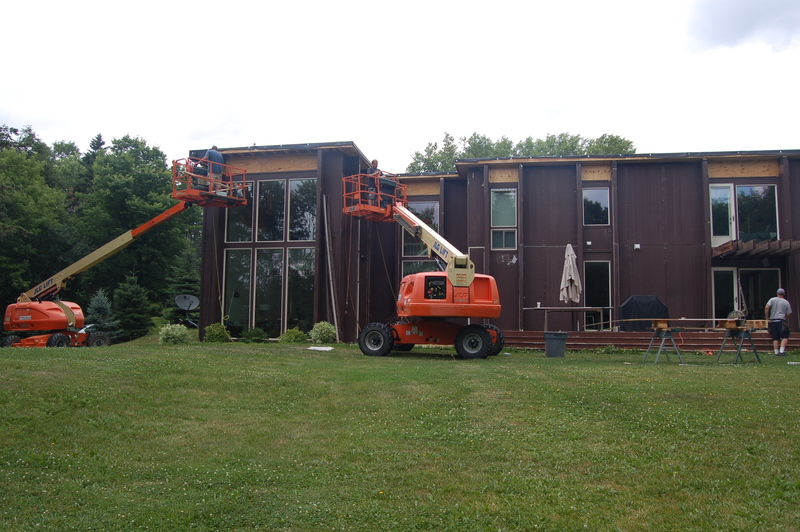 Coming up in the next few weeks, we will be getting the stained cedar accents installed on the house. I think it will really add that somethin somethin it needs for some interest, and to break up the dark paint color. One other development that happened in September/October is that I took a job outside of the house. It’s retail, and my place of work is at the MOA (Mall of America). People have been asking me if it’s fun. Not exactly fun, but it is a new challenge for me, and that’s a good thing. One perk is that I meet people from all over the world on a daily basis. I never knew shopping there was such a destination. We have always lived about 20 minutes away from it, so it has always been just another mall to us… Another perk is that my husband has been helping out a lot more with the kids and all the other stuff that happens at home. Yeah! Unfortunately, though, having a job does mean there’s less time for working on the house. There’s still so much! I have barely even started to decorate! But, wait. Remember this guy?? It might be a good idea to put that new sofa off a few more months, if ya know what I mean! 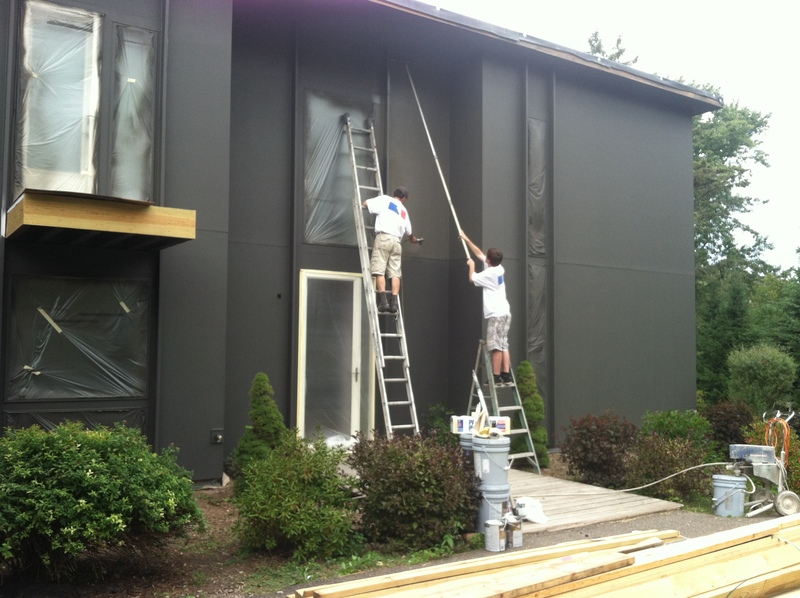 New Siding, Fresh Paint…and an Addition! Over here at This Mod House, things have been really rockin’! We are completely sided and painted, which has been a long time coming! Want to see how things went over the past two weeks? The siders started with adding trim around the windows. 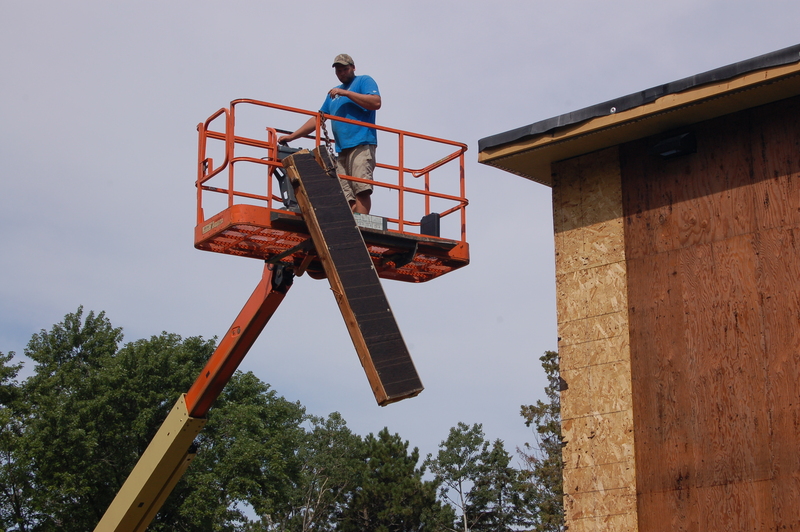 After the first soffit material was torn out (due to our late decision to remove the original fin walls), we needed to redo the soffit and chose this ventilated composite material. The siders put it up as they worked their way around the house with the window trim. And this ended up being the new siding choice. 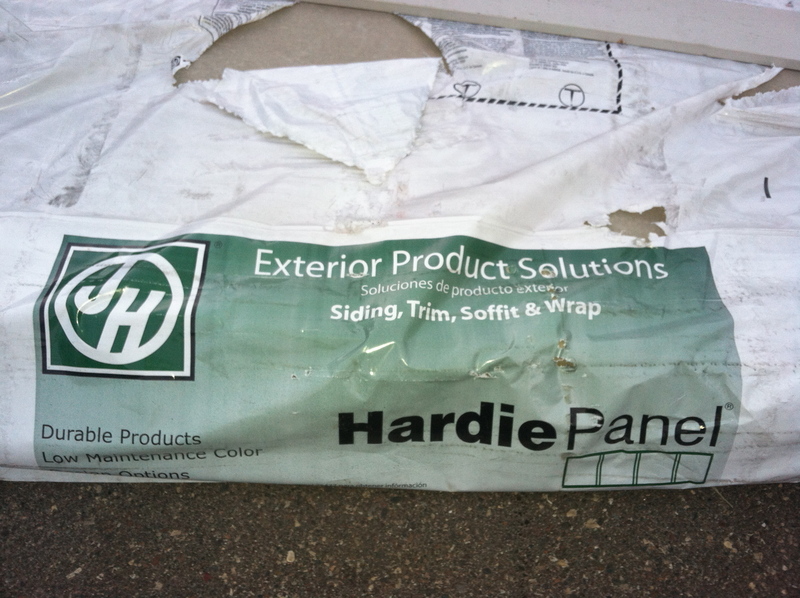 We were considering several different siding panel materials, and ended up with Hardie because it was available in a 10′ length. 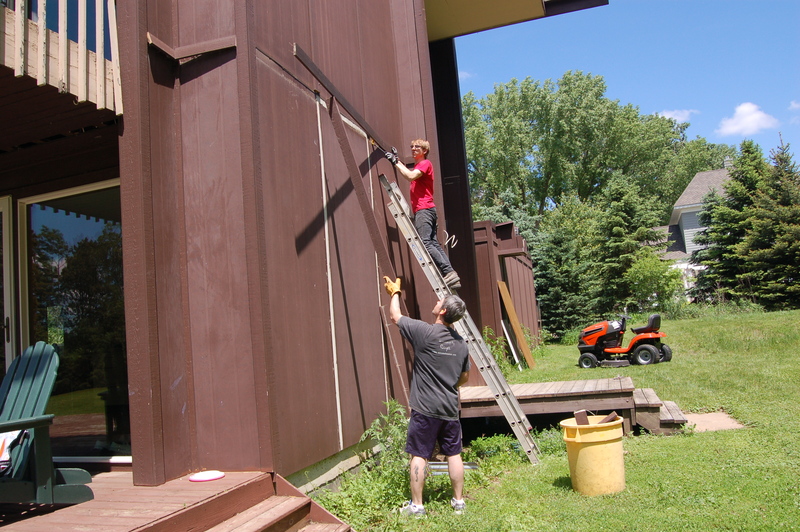 Our house is about 20′ 6″ tall on most sides, so this length allowed for two full panels with a break mid-way down and a break close to the foundation. We liked that configuration best. Siding the top half of the house was very hard work. The panels are so heavy! 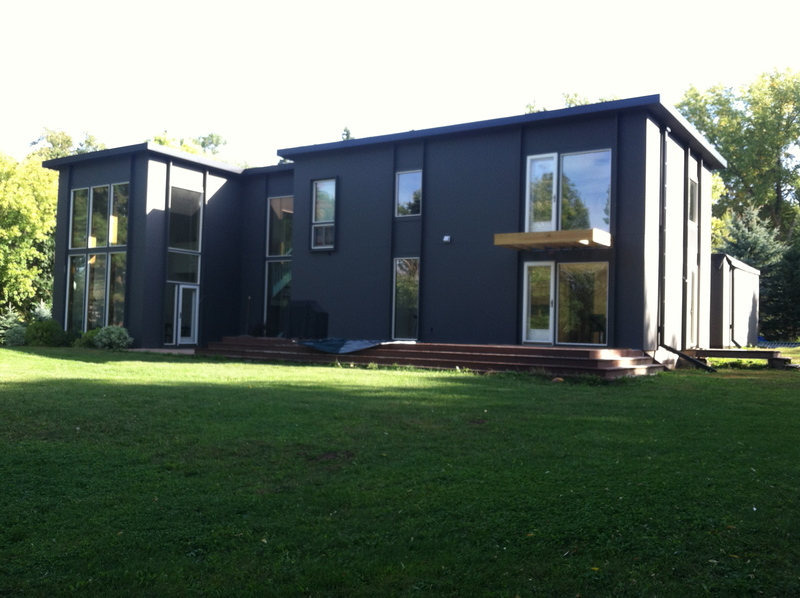 The back of the house with its new siding. 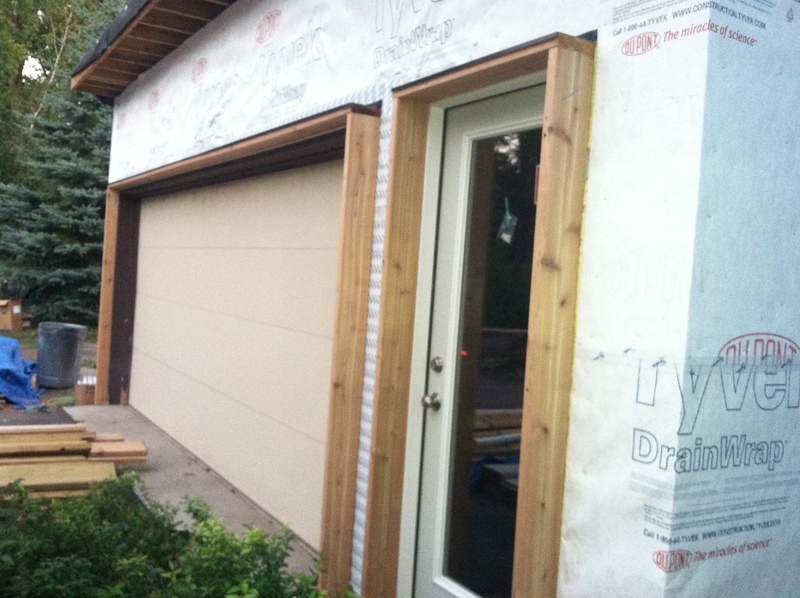 You may have noticed the 2″x6″ vertical boards running down the length of the house on both sides of the windows in the the previous photos…Here’s a closer look at this detail on the garage. 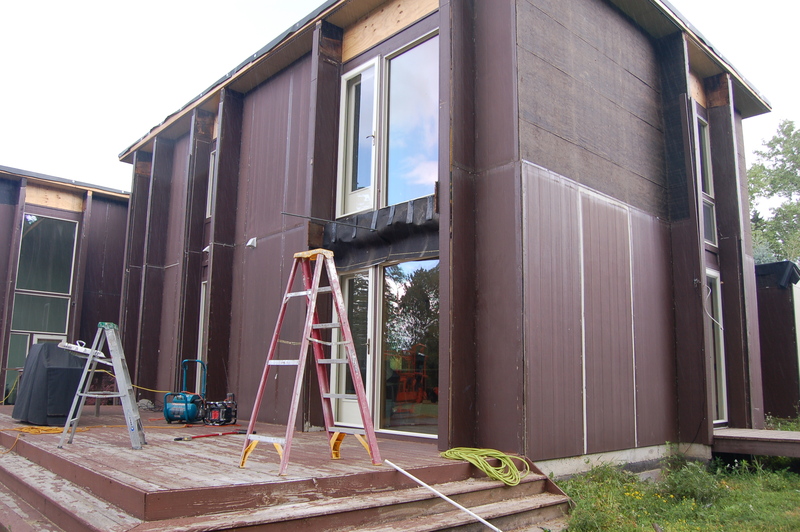 After removing the original fin walls, we thought the house looked too flat and decided to add the boards. 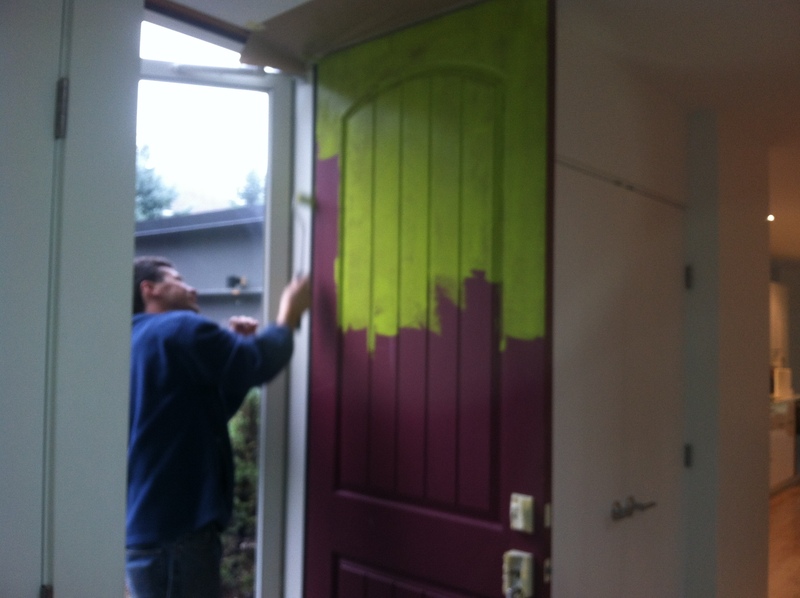 All sided-up, we needed to choose a paint color. 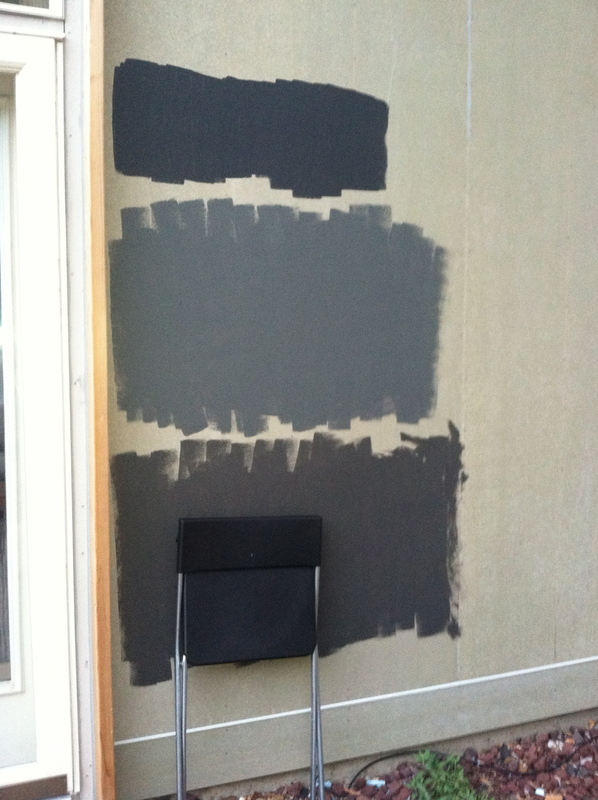 Since the beginning, we have been planning on painting the house a dark charcoal. The black chair is for reference, as the fascia and downspouts will be black metal. What color did we go with??? Urbane Bronze by Sherwin Williams! As the name implies, there is some brown in the color, but I think of it as a warm dark gray. The cooler charcoal grays felt too dramatic. I hope it’s not too dark, but I think it will be great with the planned rich-stained cedar accents above the windows. A pic from this morning. 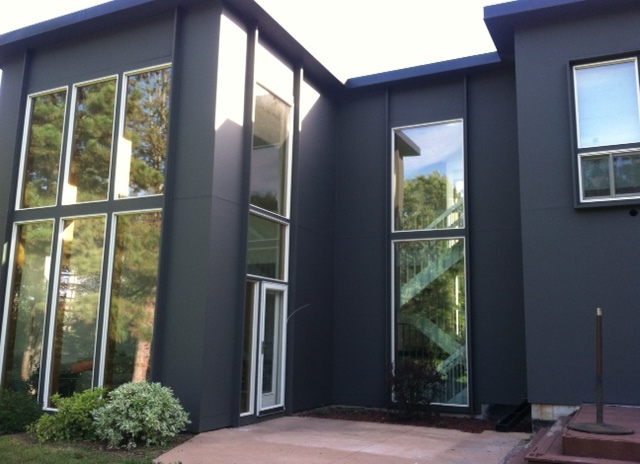 This is how one end of the house looks with the black metal fascia. Do I dare say things are starting to look better around here? The key word is “starting”….Still have much to do! 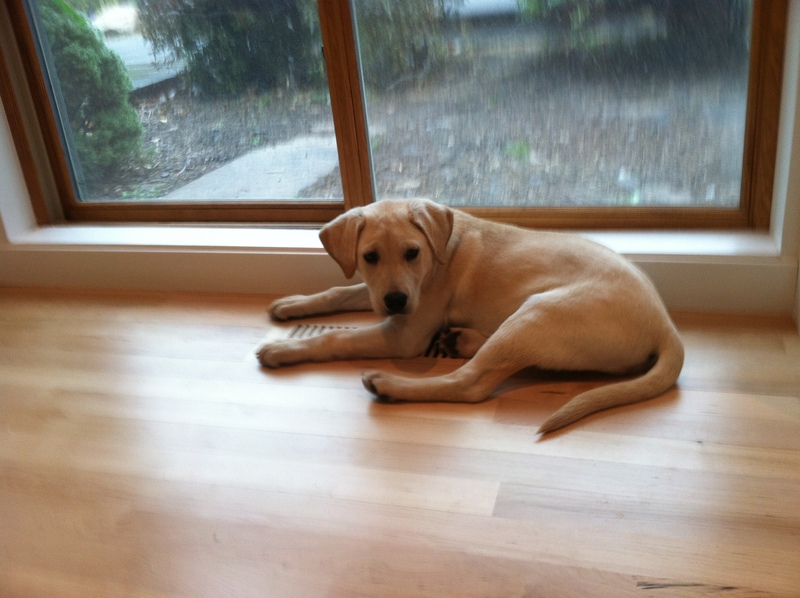 Introducing “Jarkko” (pronounced Yarkko). It’s a Finnish/Swedish name, meaning “God is Gracious”. 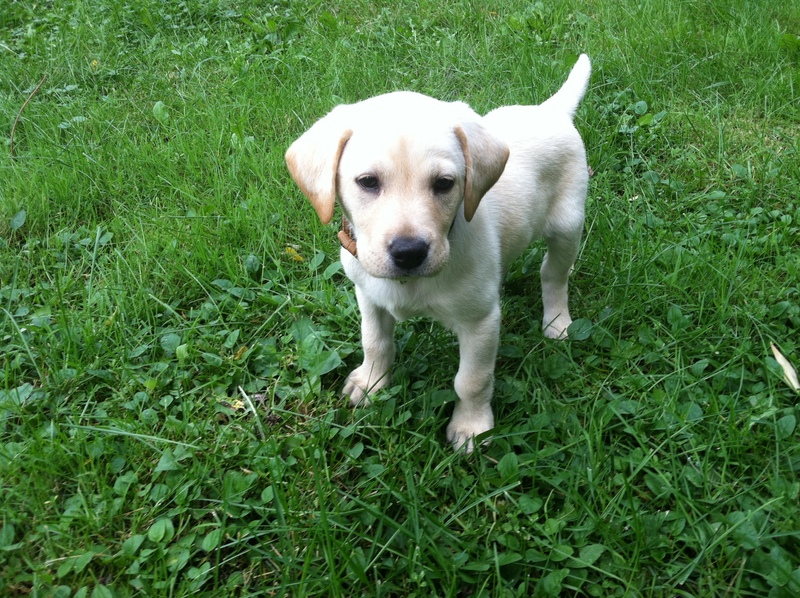 Our 8 week-old lab pup is the grand-pup of my grandfather’s last hunting dog. And Jarkko’s mother is also the mother to my dad’s last dog that he loved so much as he was battling leukemia. This is one special Addition to the family! It’s nothing I didn’t see coming. 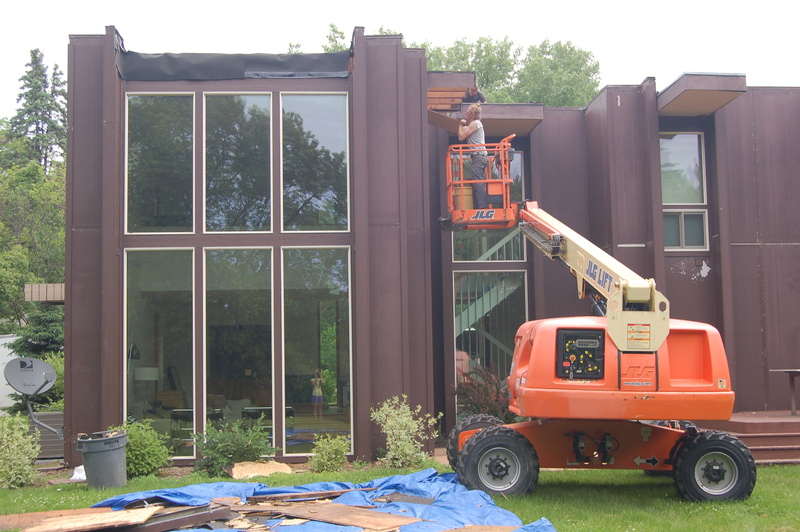 I knew this house needed a lot of work, and eventually the renovation would go from fun and games to a bit of a drag. But as the saying goes “No pain, no gain”, I am hoping the “gain” manifests itself soon, or I may LOSE MY MARBLES! Don’t get me wrong, I still love my house. Our relationship is much too strong to throw in the proverbial towel. I have seen it at its worst, looked beyond its rotting wood and peeling paint, and fell head-over-heels. And , inside, it cleaned up really well. So smitten with its new handsome maple floors and open-plan layout! Who says they’ll never change? Outside, the transformation has been slow, and things seem to be going in the wrong direction. What was supposed to take the month of June, start to finish, is now in its 3rd month, with no end in sight. Why? This bad-boy of a house has some serious problems, more than first understood. Hint: That’s where this post is coming from. And because no one likes a Negative Nelly, I want to assure you I have tons to be grateful for in terms of the house reno: (45 minutes later…) Well, I guess “tons” is a bit of a stretch, but I can say that I know in my heart that we will get the results we set out to achieve. It just might take a lot more time than expected (and our first-born’s projected college tuition – Sorry Kiddo!). 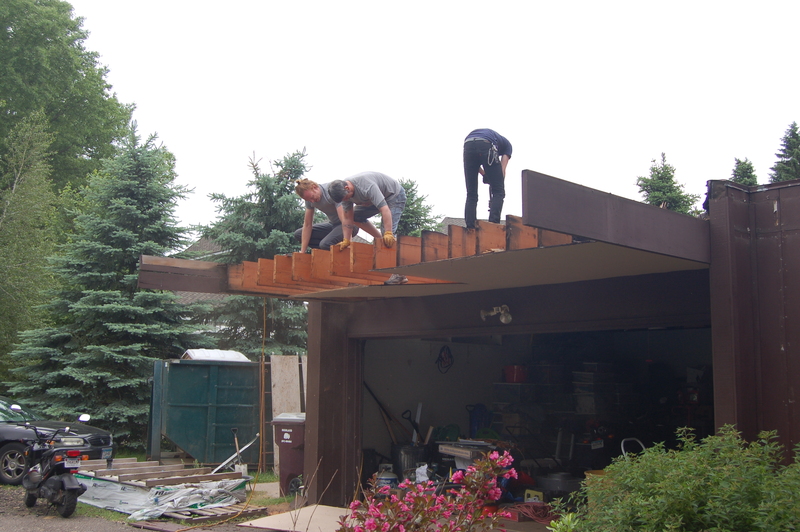 Guys hard at work installing the soffit material. You can see the soffit all closed up, with the continuous venting, cut around each and every of the 24 fin walls that enclose the window and door areas. Just to be clear, the work shown above took about a week, and two of the days included a second “crew” on a second lift. That Friday morning, there was an unfortunate (but not completely unexpected) discovery. 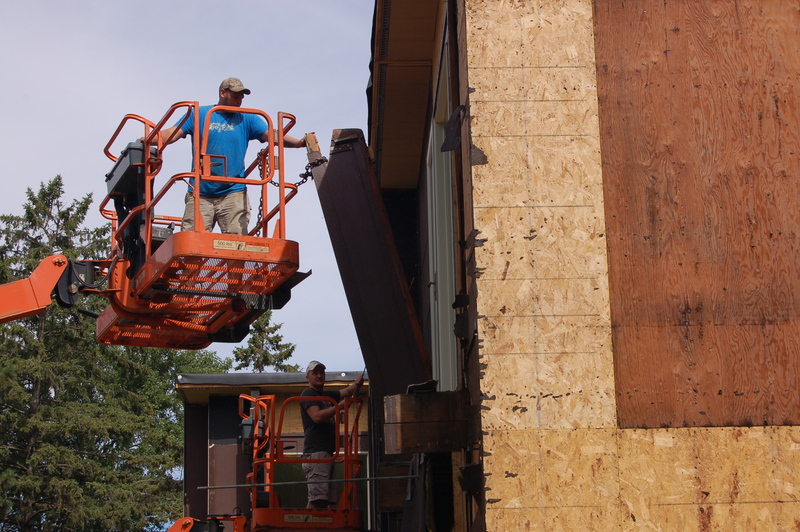 When starting to replace the worst siding panels, it was determined the wood underneath was rotten in the areas by the fin walls/windows and compounding the problem, the windows were improperly installed and flashed. A meeting of the minds resulted in an entirely new plan. The fin walls were to come off. All of the siding was to come off. The soffits and venting completed the previous week would have to be redone. 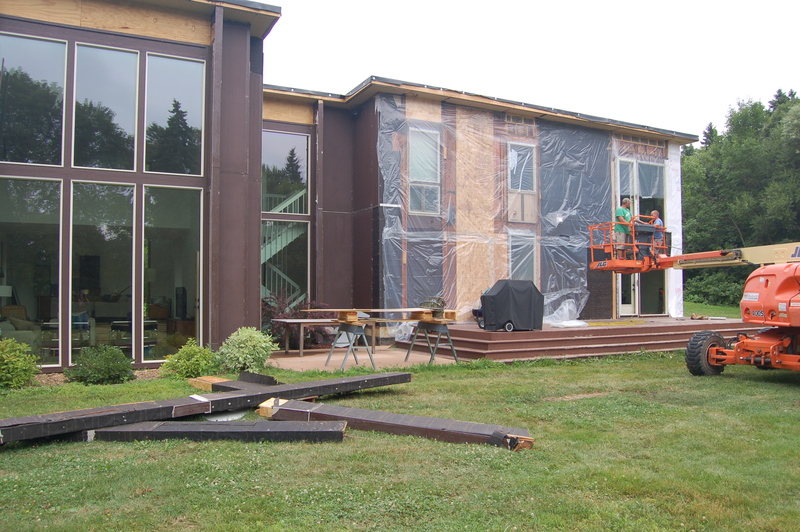 And when that got going, the observation of little/missing insulation in the walls led to upgrading the basic house wrap to a 1″ thick foam board. Ultimately, this was good for the house. But bad for the wallet. Gulp. Removing the fin walls was a big job. The method of choice involved cutting it and prying it loose, and finally pulling it off the main body of the house using a chain. The lift supplied the power necessary. Lowering the top half to the ground. Temping where the fins are off. 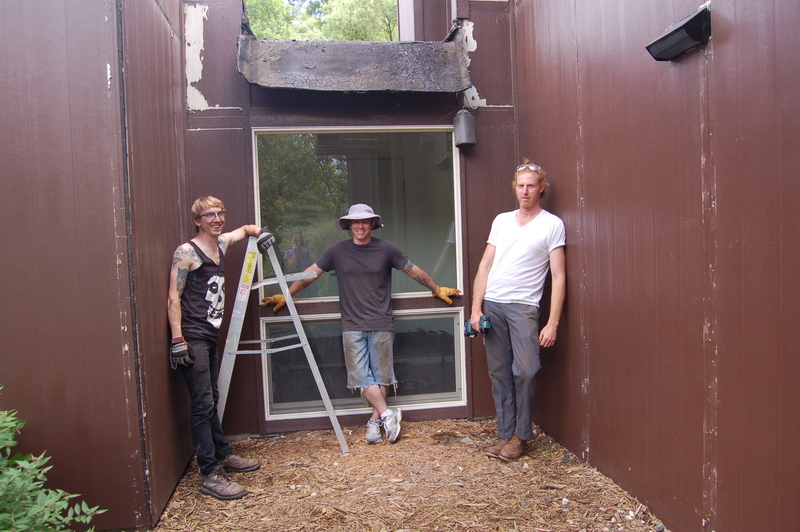 Working in sections, the guys removed the fin walls and put up the insulation panels. 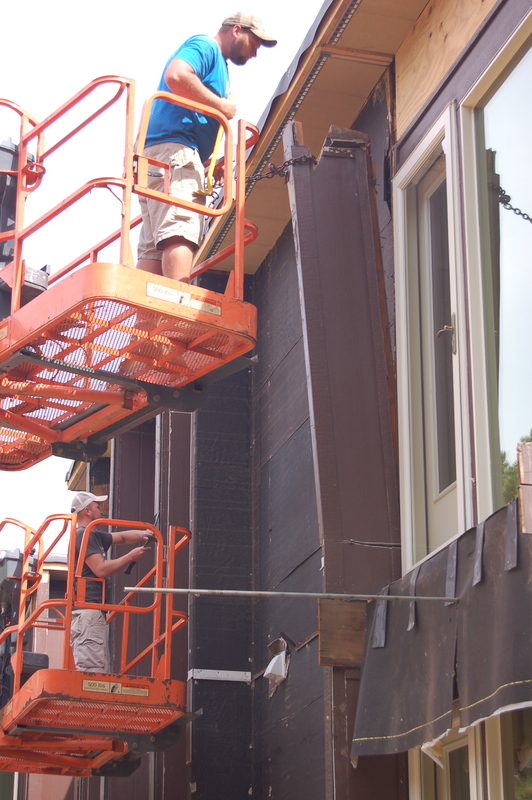 1″ foam board will insulate and bring the wall almost flush to the window framing. The front of the house. 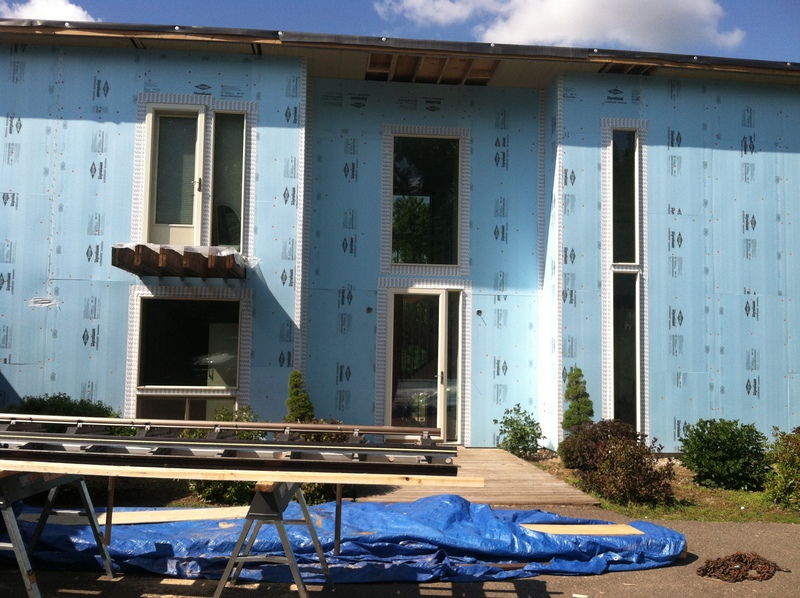 Foam panels are on most of the house by the end of last week. The seams are still being taped today. Where there once stood a fin wall, a concrete support must be removed to the ground. 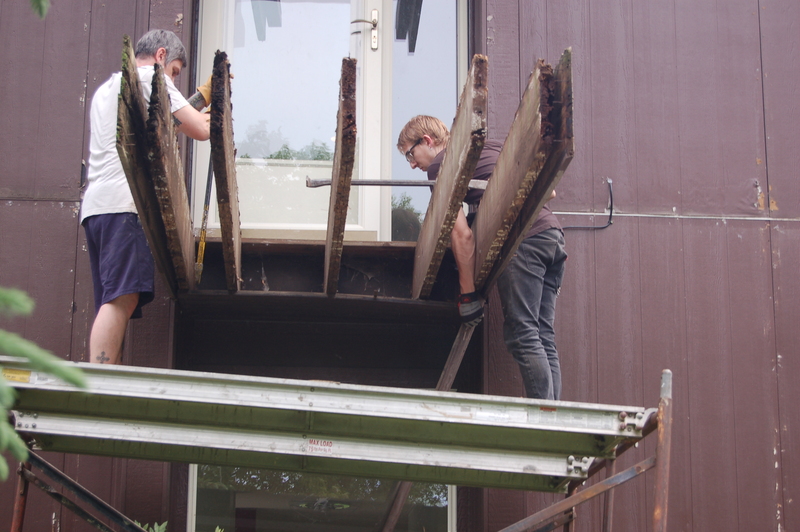 Taking down one of 22 cement supports…. Deck boards coming up to get at the concrete supports. 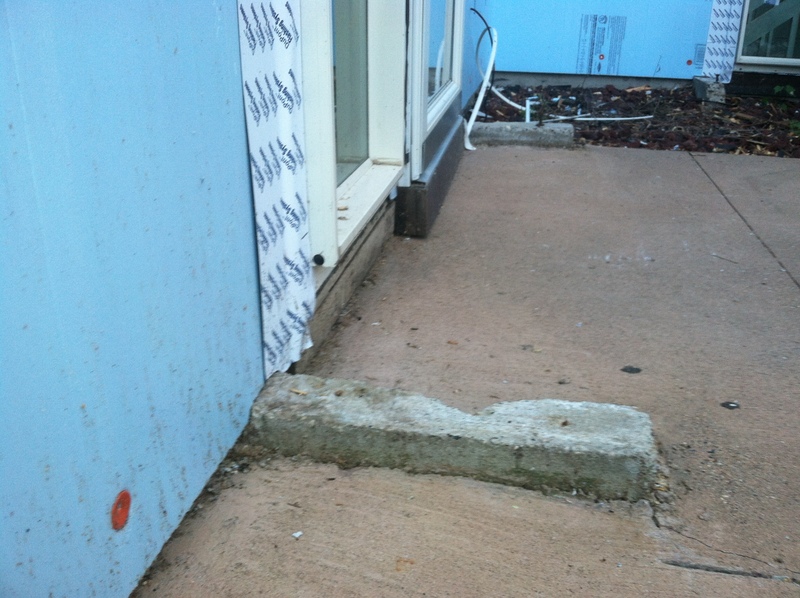 The concrete needs to be taken below deck level. It’s kind of hard to see the details, but we plan to trim out the windows with larger vertical boards to create new, but less dramatic fin walls to contain the stained cedar accents. 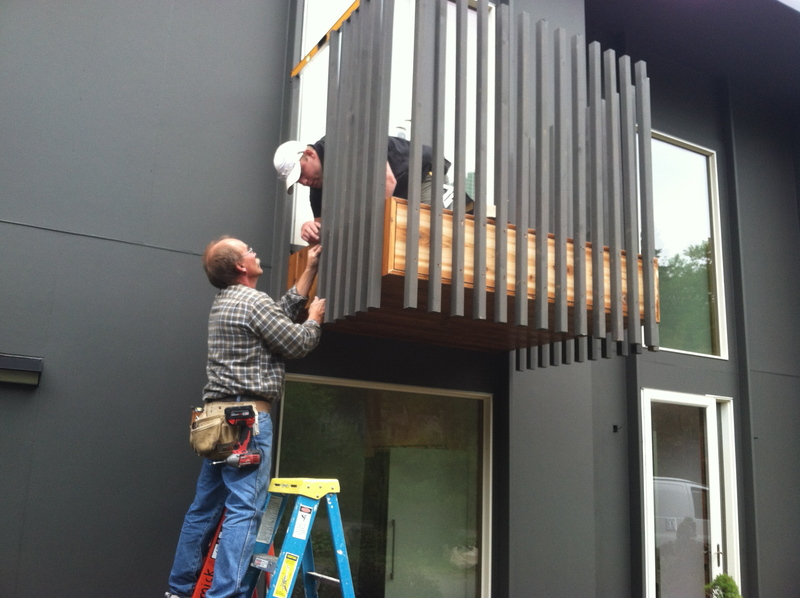 The decking on the balconies will be cedar, and the railings painted black. 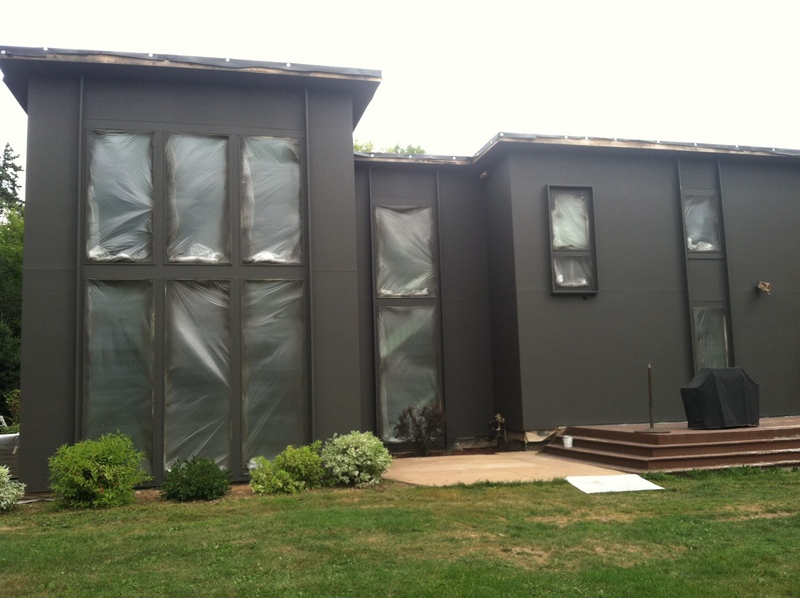 The siding material is still getting figured out, but we like the idea of painting it a dark charcoal. As much as it’s difficult to be changing things up so late in the game, we know we need to do it right. In the meantime we will be practicing patience and hope the change-order monster stays away going forward! Oh, and I wanted to share what we found when we returned from a 5-day vacation! 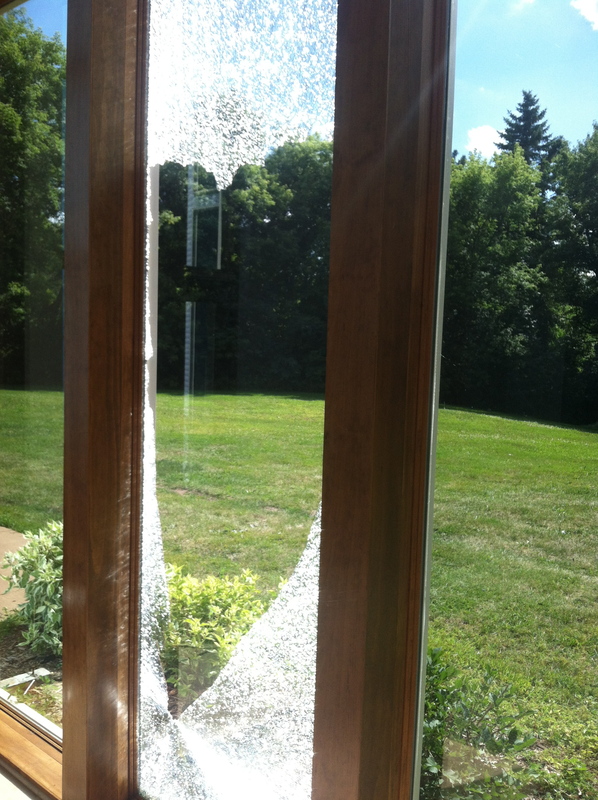 Sure it’s a broken window….And we still don’t know the cause, but can you see the glass shattered away leaving the shape of a heart? I am taking it as a sign that our house loves us back. Summer is upon us, and what should be a more carefree, relaxed few months of the year, has taken a different turn in my little world. No trips yet to the lake for me. No m’am/sir! More likely, my summer day includes a trip to Menard’s and Home Depot. What about gardening and planting flowers? Fuh-gid-a-bad-it! Anything within 100 feet of the house is in the work zone, and sure to get trampled. Ah, the joys of remodeling! 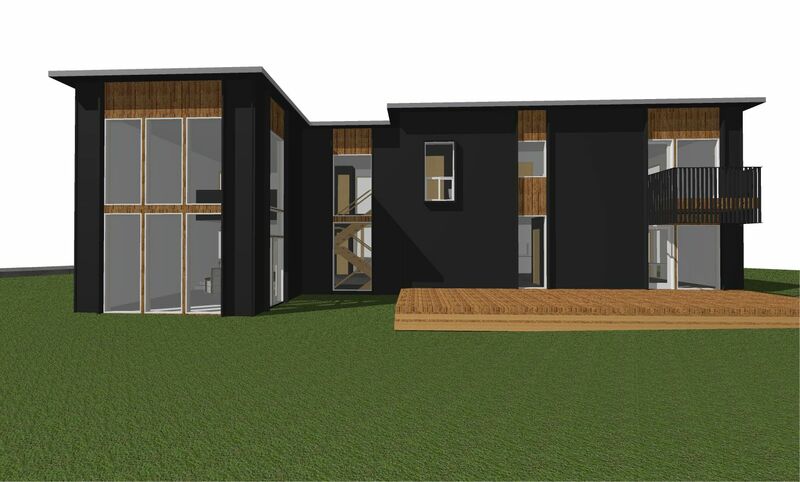 Okay, I am being a bit dramatic… It’s not like this house project has been forced on me. I chose to take it on, and happily so! (Why didn’t somebody stop me???) Anyway, it has been quite the challenge with many ups and, to be fair, many downs. I wonder if there is such a thing as “renovation therapy” to get people through the tougher legs of the house-improvement-journey? I swear I have developed multiple personalities since this all began…I’m only kind of kidding! What’s the back-story for this woe-is-me attitude? It has been a slow week on the ‘ole pra-jay. 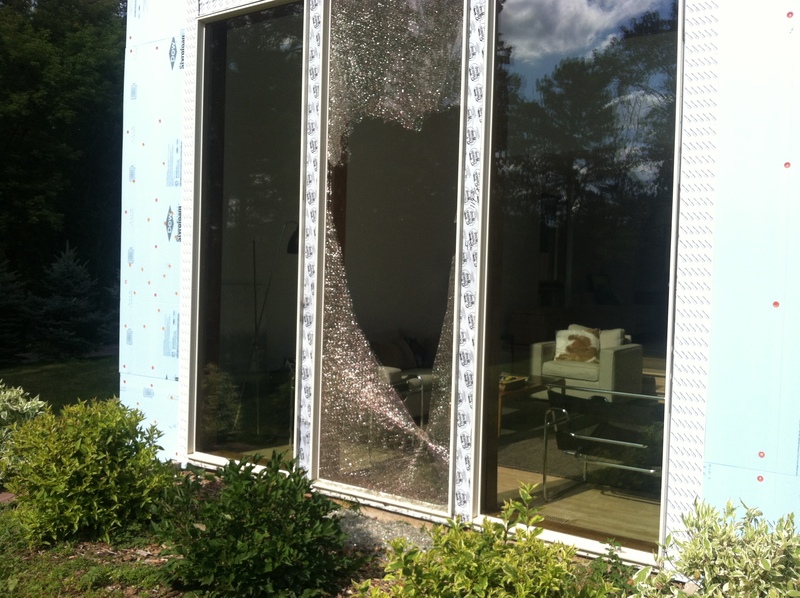 I have been crazy frustrated, as the weather has been cooperating, but not the workmen! There have been various excuses made for the guys to not be on my job, like incorrect weather forecasts, and my not being cool with the carpenter’s 7-year old kid coming to “work” with his dad all day….But I know these guys have other jobs going, and you know what that means. My project was being stalled. Of course, I complained. A lot. Called, texted, emailed. Lots of negativity (by me). I put my foot down! No more Mrs. Nice Gal! You might even say I was being just ever-so-slightly bitchy (no doubt)…. So this is the craziest part: James, the builder/remodeler/owner, had a way of talking me through the frustration and helping me understand the situations. His response to each complaint seemed genuine, and he always pledged to try to resolve the problems. One point that has been made is that our project is different than most. 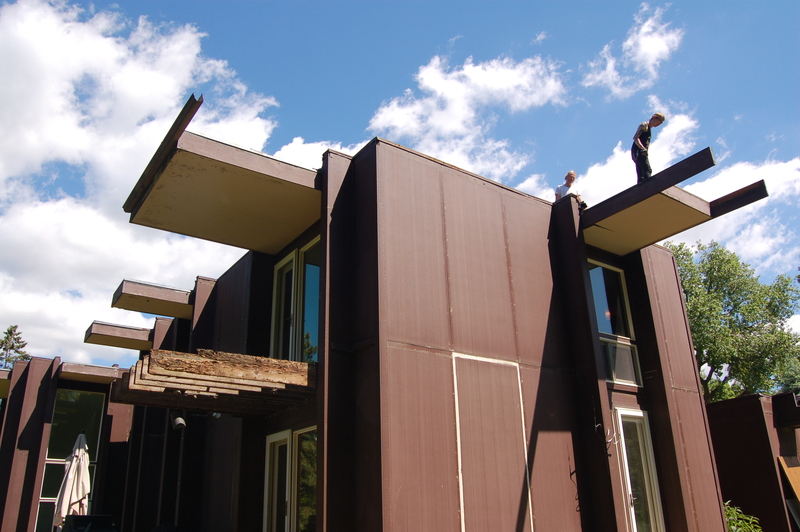 It’s residential, but has a lot of commercial-type details like the flat roof. Mod houses like ours come with unique challenges, and there doesn’t seem to be a lot of dudes around who are super comfortable with this type of residential design. Many of the subs primarily work on commercial projects, so there’s a few things that get “lost in translation”, in dealing with me and my house. Anyway, James most definitely has talent when it comes to calming down a client in a tizzy (Now, if he could just promise his guys will come to work each day…)! 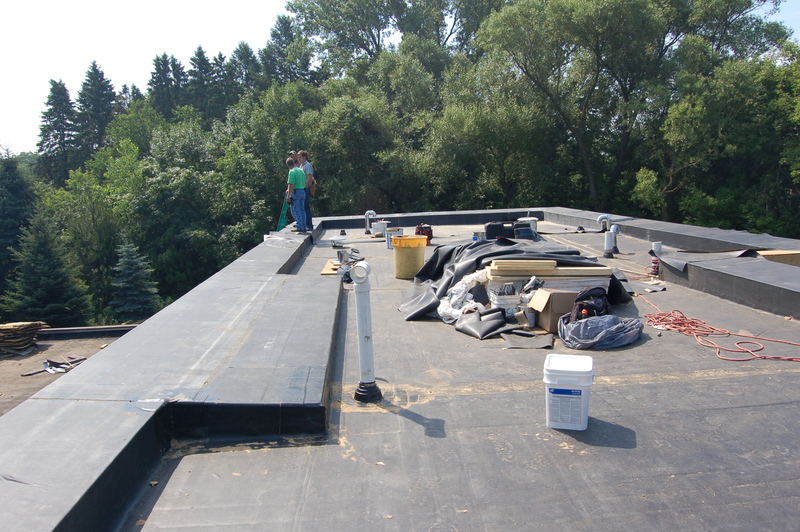 The main roof has been insulated, pitched, and has its fully adhered rubber membrane glued. 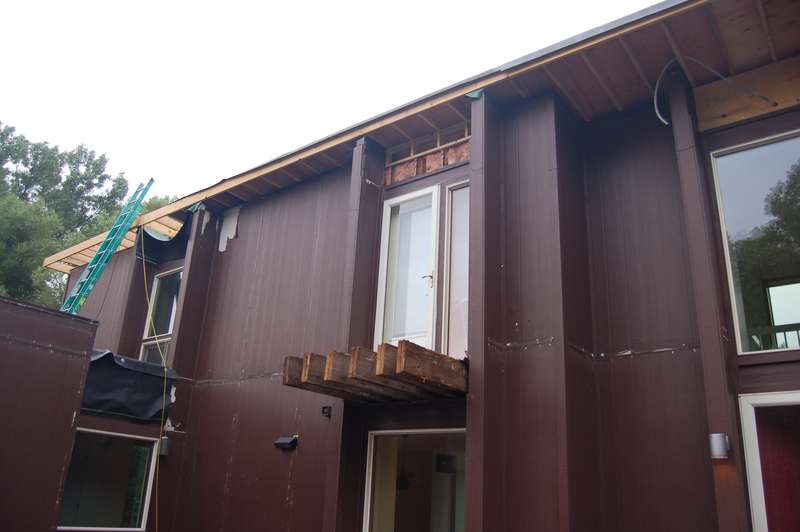 The raised part is the top of the soffit that goes around the whole house. 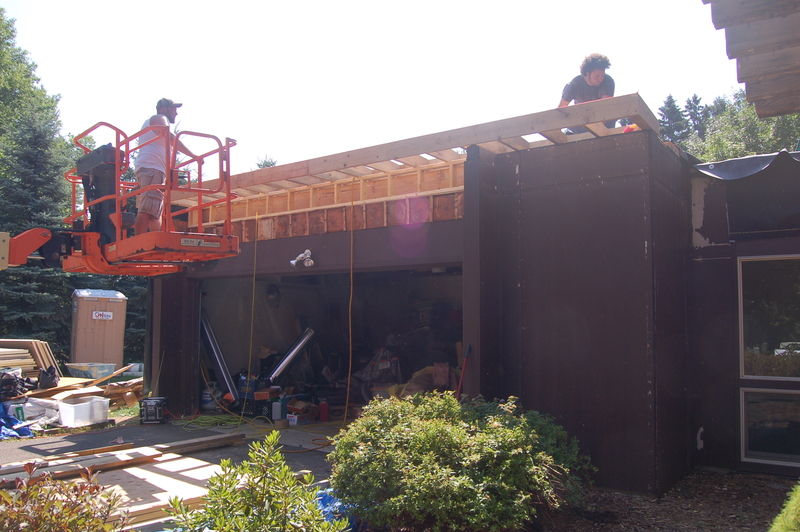 With the main roof mostly complete, things got going on the garage. 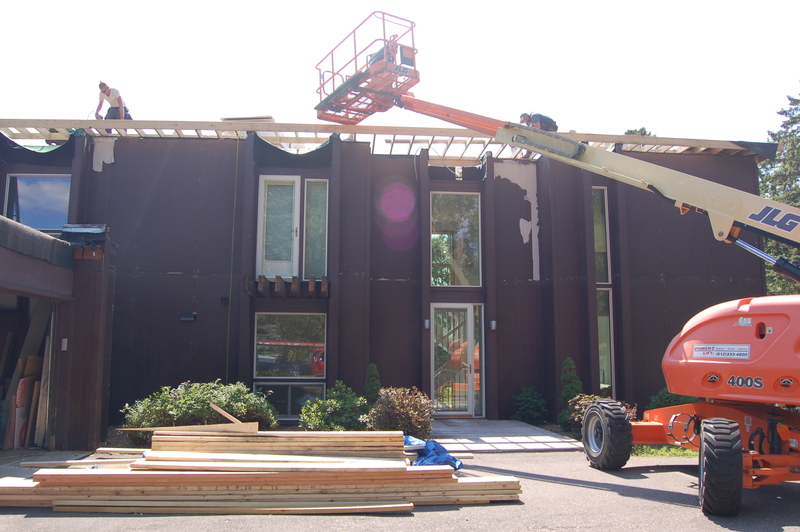 Here, you see the new soffit getting built. It will only be on the front side. Other sides will be flush with the walls. 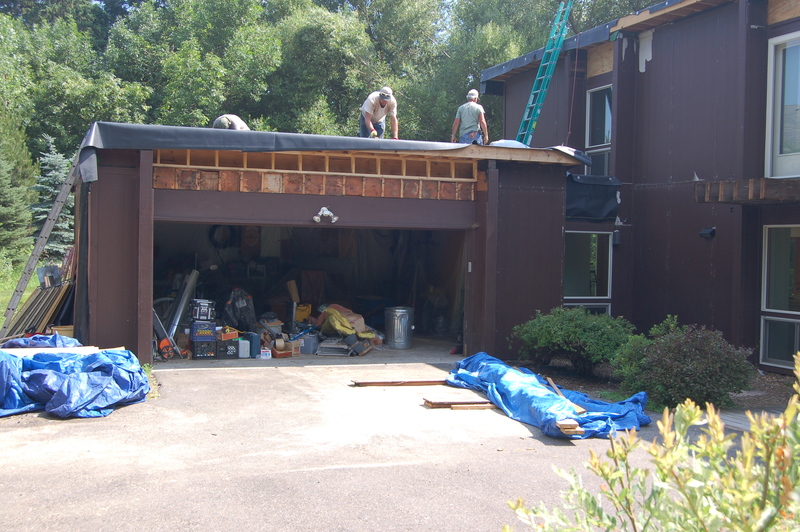 Roofers take over, giving the garage the same treatment as the main house. The garage roof all done (except for finishing touches on the parapet). Isn’t it pretty? Close-up of the scupper, where the water drains from the garage roof into a future downspout/gutter. 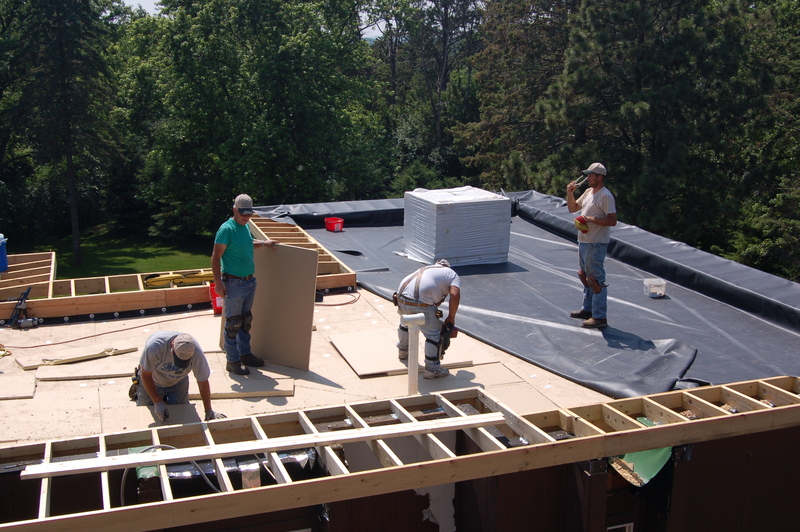 The guys are adding the strip vent and the underside of the soffit. 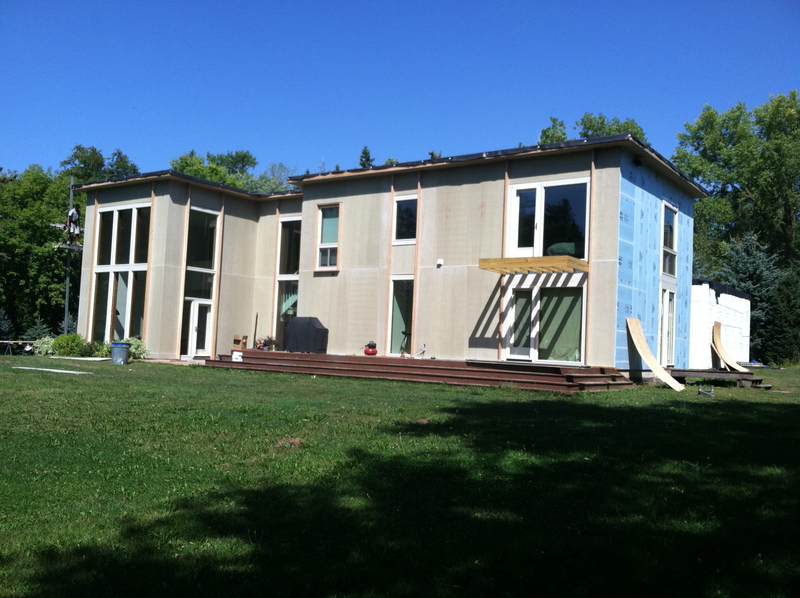 It’s the same stuff (Hardie Cement Board) as the siding and will be painted along with the house. Today I am feeling positive, even optimistic, that the project is en route to completion. I won’t get my hopes up too high, as I know there’s lots left to do, and surely a few roadblocks to come. But, I will take this “up” mental state for now, and when the “down” surfaces, I know James (aka “The Remodeling-Client Whisperer”) is just a phone call away. 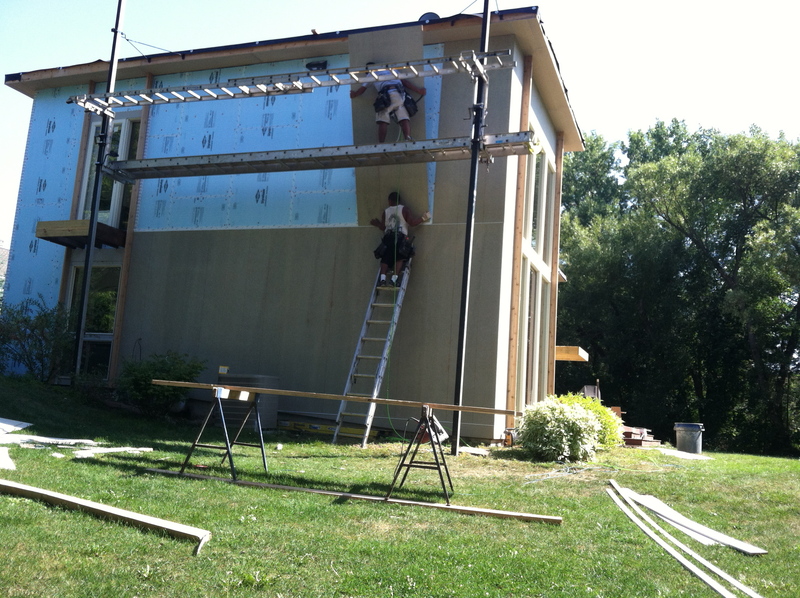 Last week, framing the soffit on the front of the house. It’s deeper over the front entry, as that area is recessed back from the rest of the facade. Like that it will provide some protection at the front door! Here’s what you see on the ride up in the basket of the lift…. cool perspective! 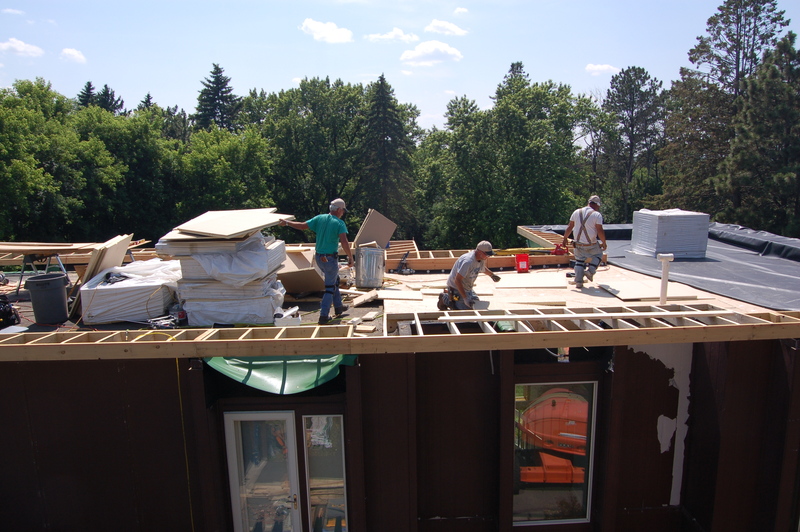 The roofing crew, getting a start on the north end of the house. 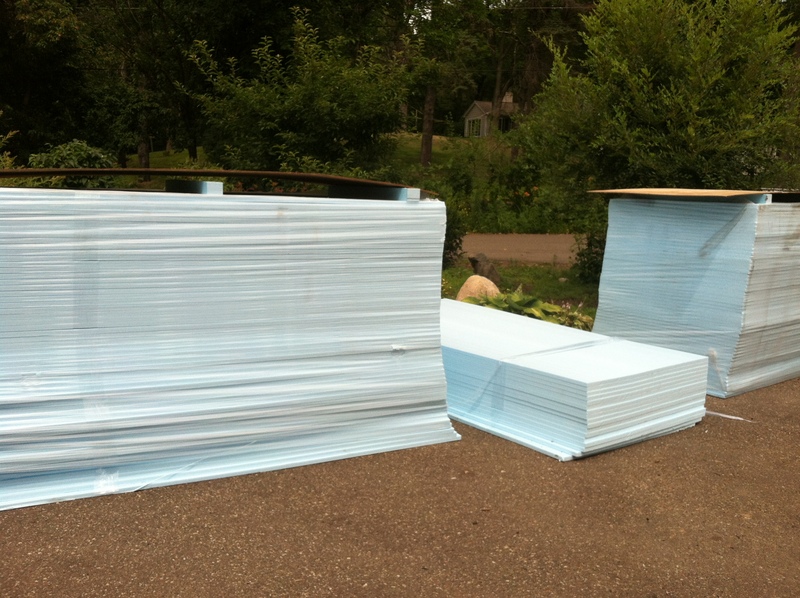 That’s an insulation product stacked and cut to create better pitch and swells to the planned scuppers/gutters. 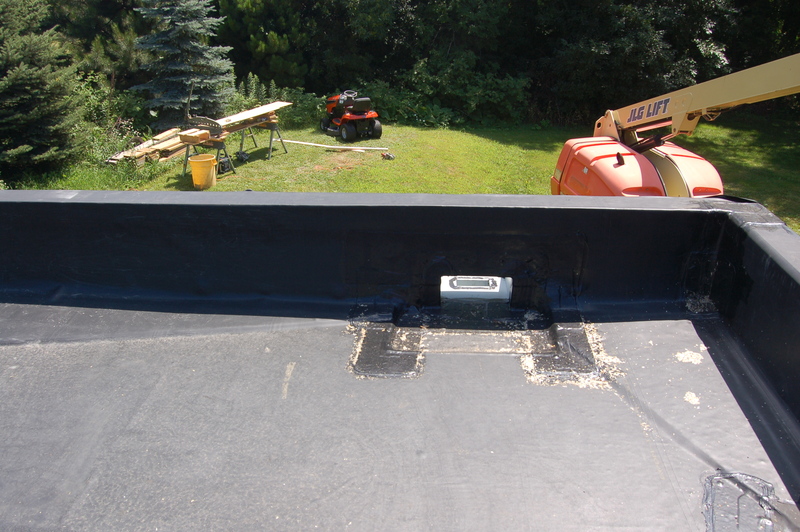 The black rubber membrane is glued on top. A look at the garage roof from above. 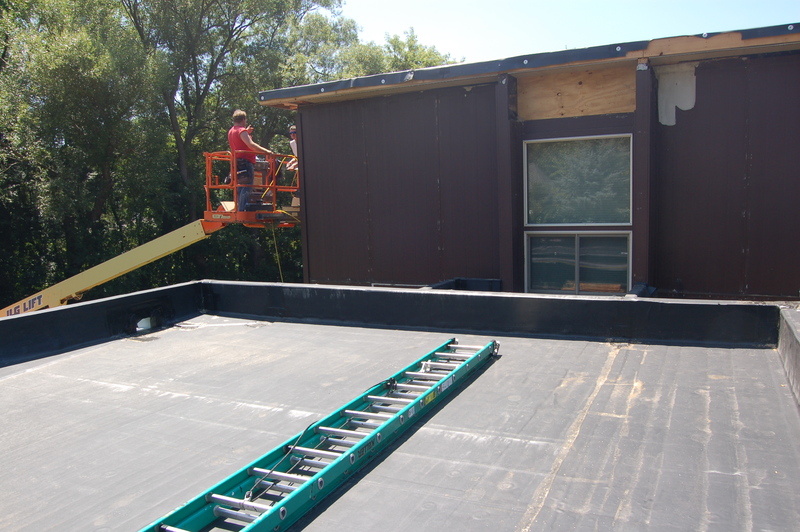 The roofers have glued rubber membrane on 2/3 of the house. They have been working on it in sections, in conjunction with the carpenters. I have been told it will be one more day (hopefully tomorrow!) to tear up the old stuff and put down the layers of insulation/pitch and rubber on the remaining 1/3. Our roof should be watertight at that point. Yay! 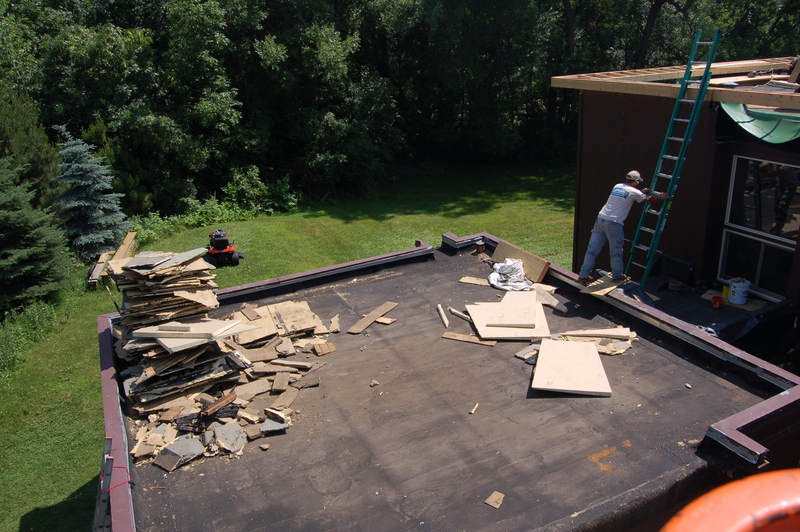 By my next post, we should be pretty well wrapped up with the new roof, and moving on to the siding work. There will be some decisions to be made concerning the paint color and cedar accents. Looking forward to it! 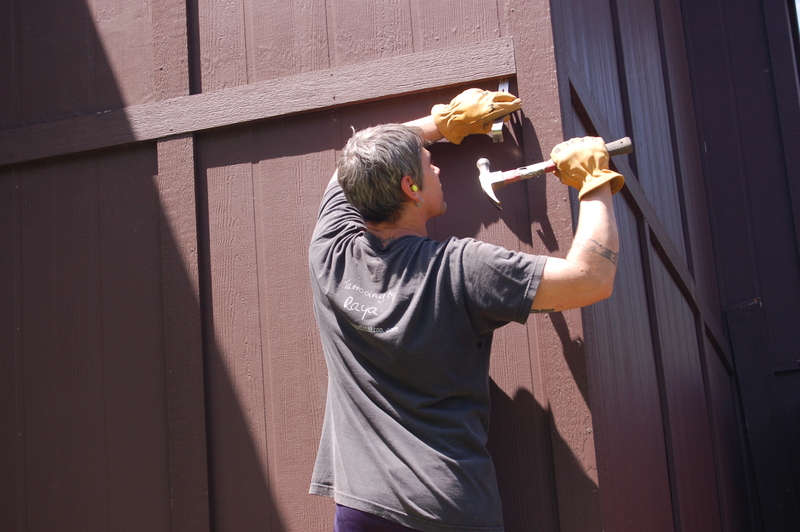 This Mod House Exterior Remodel Begins! Back side of the house, basically pre-reno. 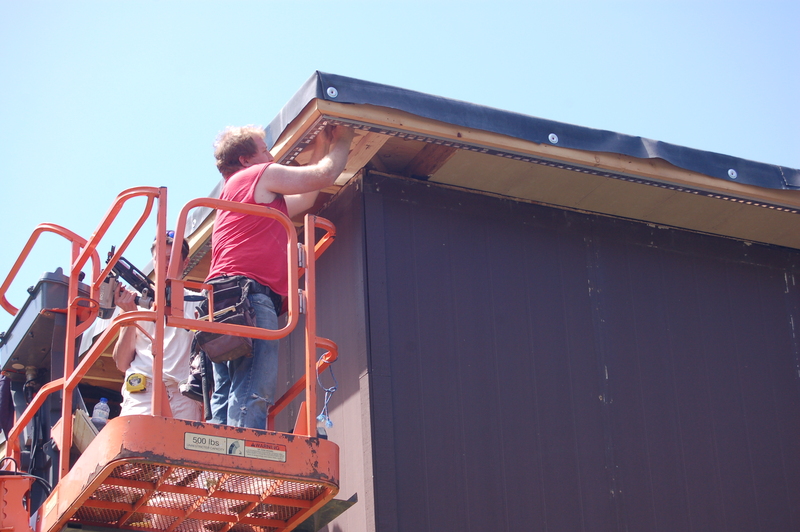 The guys begin by removing all of the batten trim covering the seams of the Hardie Board siding. Battens carefully removed. We will be reusing some of this material. 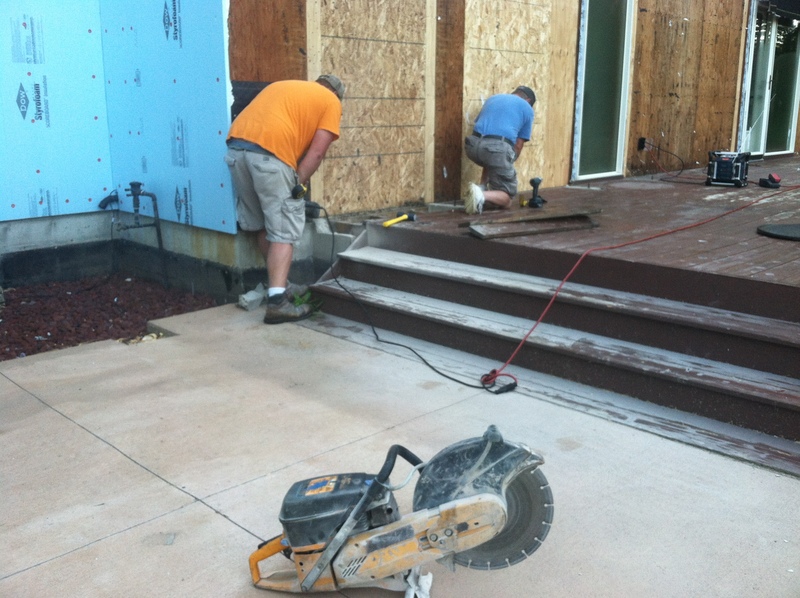 In addition to the batten removal, the guys started demo on the rotten decking of the two smaller decks. Decking off daughter’s bedroom and upstairs loft on the front and side of house. 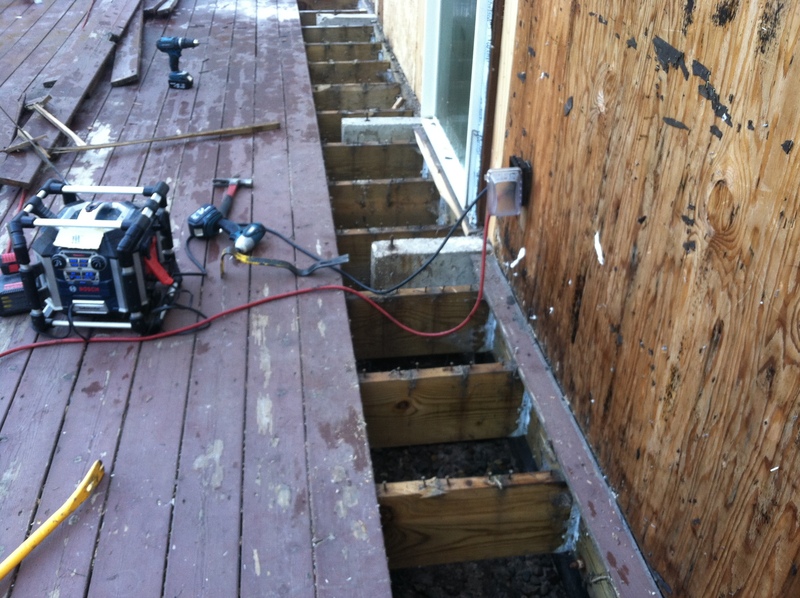 This deck is totally rotten and getting totally removed. On day #3 (this past Monday), the crew of two became three. I got them to stay still for a minute. 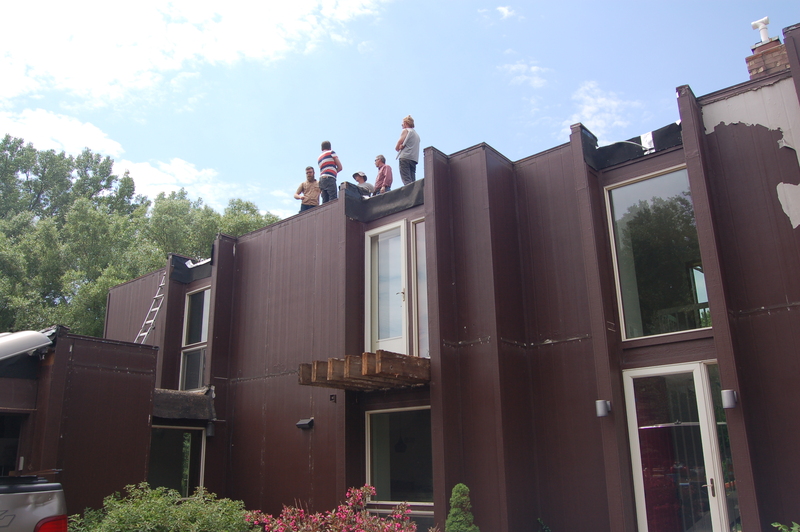 These guys worked all day tackling the master bedroom deck and then went way up to get familiar with the awnings…. One thing these guys are not, is afraid of heights. As you can imagine, taking apart the awnings from above is slow and dangerous, at best. 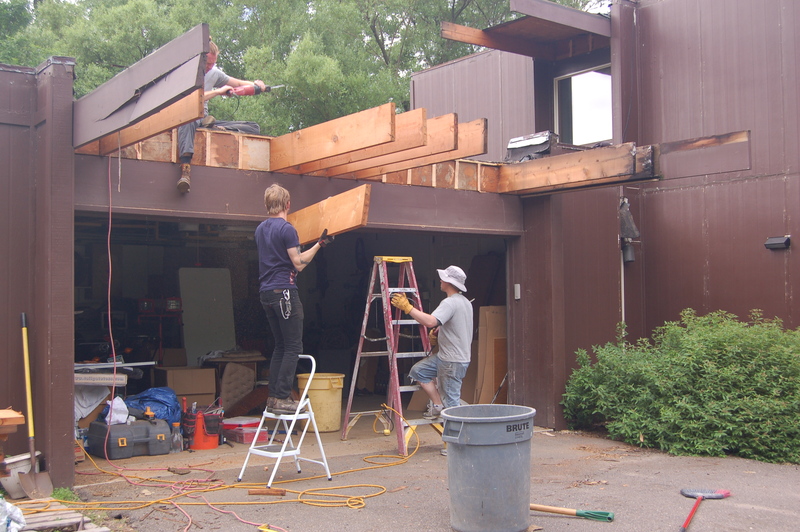 Dismantling the awning over the garage. Still dangerous, but so much better. 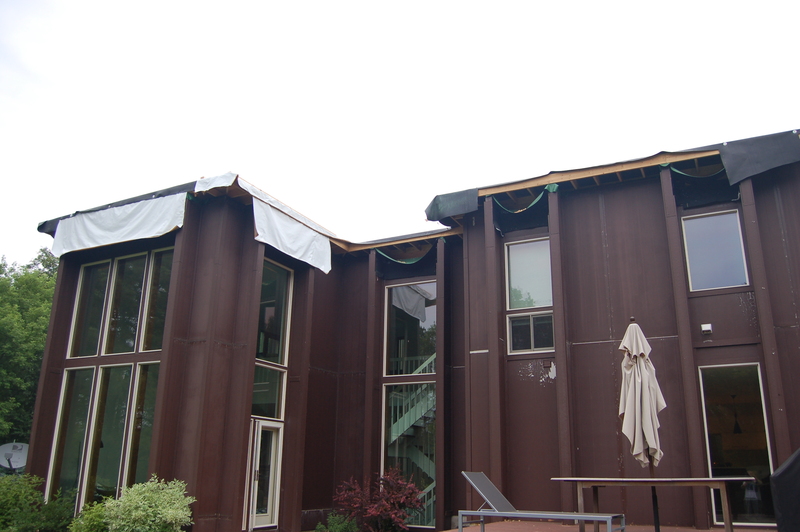 The awnings (all 14 of them) come down much, much faster. Our two story window wall has lost its visor. 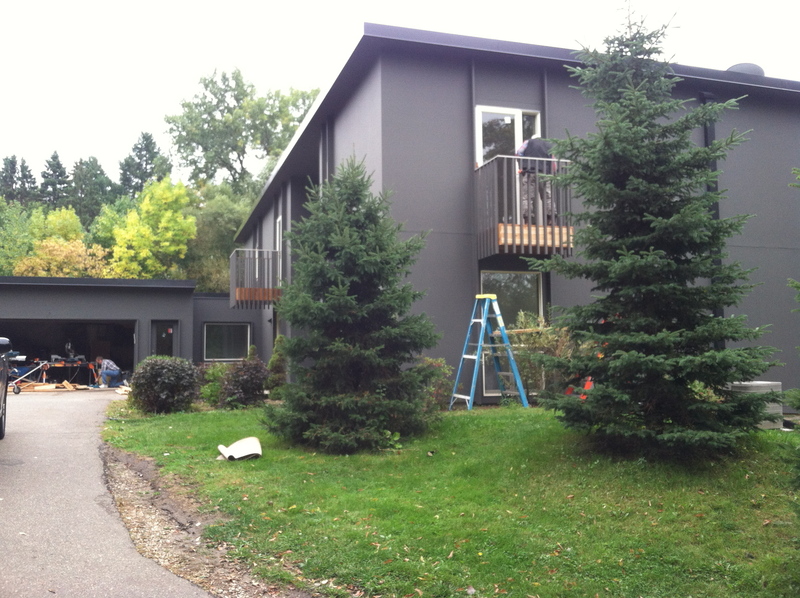 The house is taking on a new look without the “diving boards”. 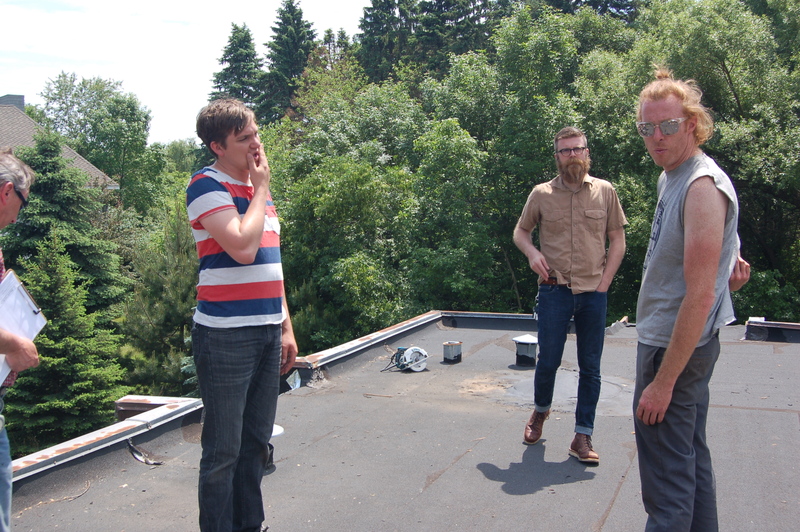 Just hanging with the roofer (far left), James, Mike, and Forrest. 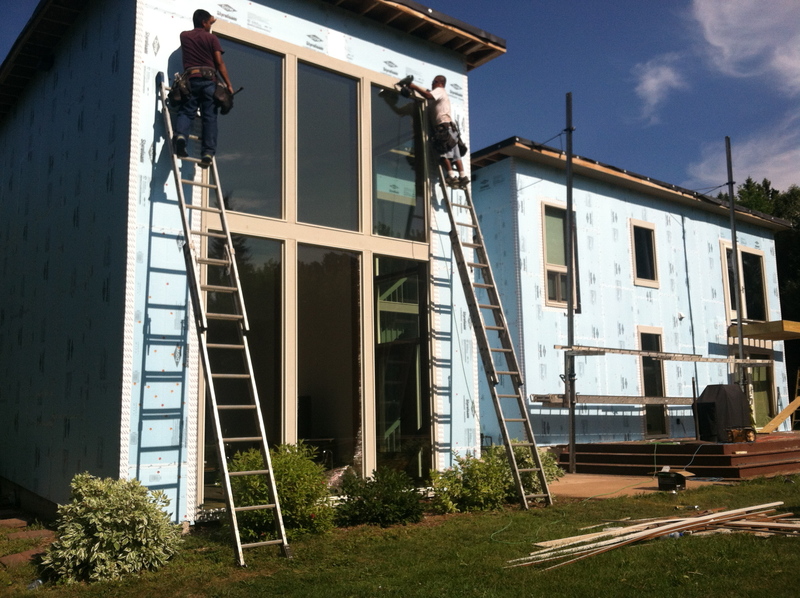 James and Mike are the owners of the renovation company we hired for our exterior project. So here we are, 5 days in. Things are going well, as far as I can tell. No big surprises. The plan is to get rid of all the rotten/rotting icky stuff. 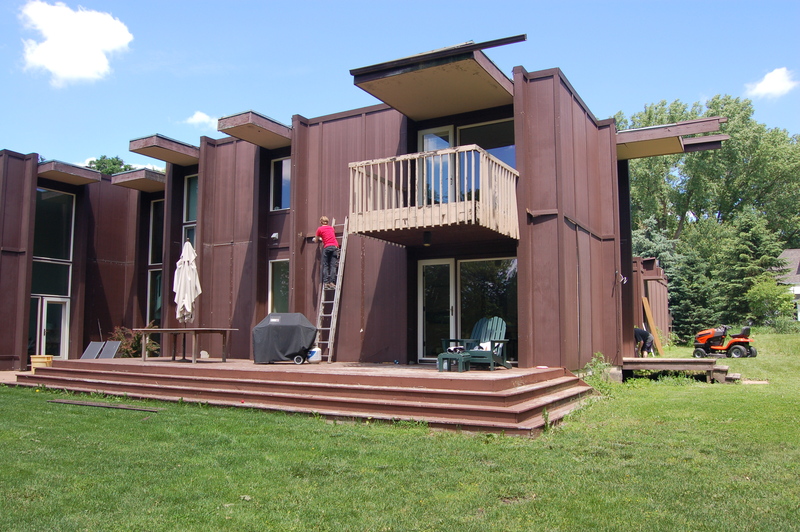 Bye, bye existing decks and canted awnings! An approx. 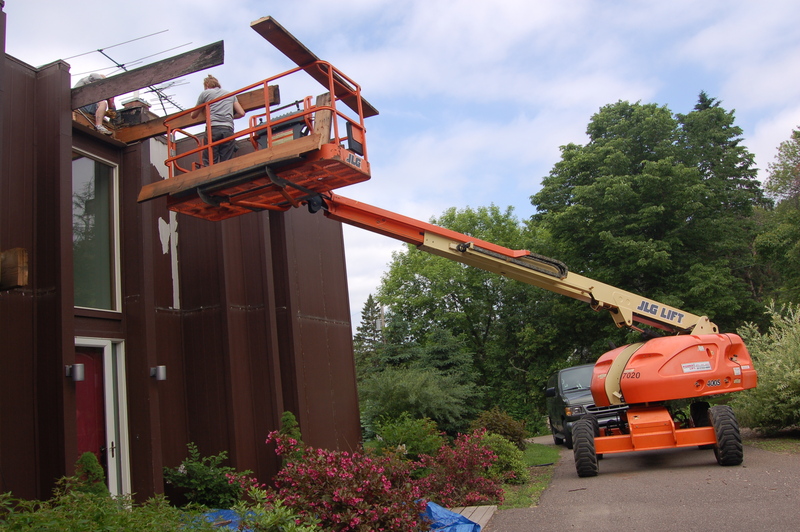 2 foot soffit will be added around the entire house to clean up the roof line, and we will be getting a new rubber roof (which is one of those things that cost a lot of money and go unseen–shoot!) At the time of this post, we have decided to rebuild a mini balcony off our daughter’s room (Shhh! It’s a surprise! ), and one off the master. There are plans for a service door for the garage too. Other than that, it’s pretty much painting the whole house, and adding some stained cedar accents on select areas. So glad to be back at it–making this house our home. And if you are wondering, I have more to talk about regarding the inside, just not more time today. Plus, I have kept you too long already! Thank you for reading and have a good one! Inspired by nature and all things design, I am always looking for ways to bring more creativity and beauty into our everyday lives. Renovation Momentum: White Walls, Maple Floors and Ikea, Oh, My! An introduction is in order.